Author husky13836Posted on February 20, 2016 February 20, 2016 Categories BeerTags Beer, homebrewing1 Comment on Homebrewing: A fun life. We decided to head up to visit my parents on the Canadian boarder and of course it was crucial that we make a stop on the way. 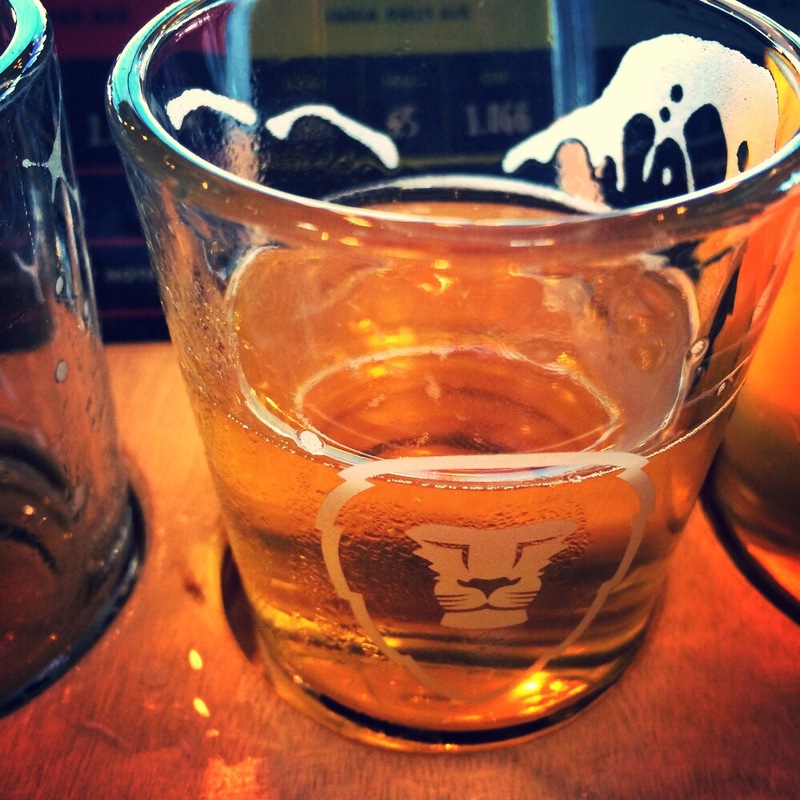 It was a beautiful, sunny, Friday afternoon when we pulled off in Bellingham to visit Aslan brewing. We were not the only folks who decided to start our weekend early at Aslan, it was packed. This is a really great brewery, it has a full kitchen/menu and a great selection of beer on tap. I put a fair amount of weight on whether or not a particular brewery seems like a place I would want to hang out at on a free afternoon. Aslan is a brewery I would make a weekend trip up to Bellingham to visit. This trip was months ago, and I STILL think bout the pork rice bowl I had for lunch that day. 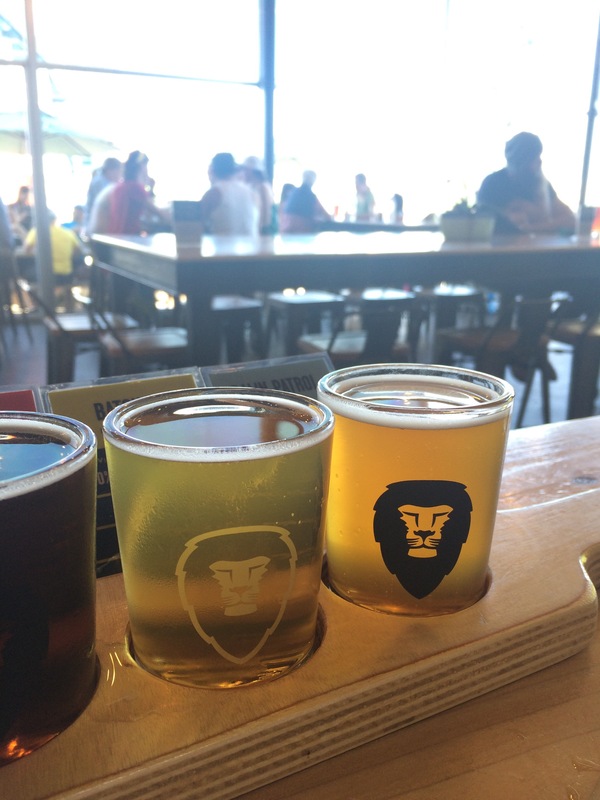 Since it was our first visit to Aslan we decided to share a sampler. I would highly recommend this if it is your first visit here. If you only have time for one beer, I would suggest the Batch 15 IPA. This is one of the best IPAs that Matt and I have found on our WABL journey, we liked it enough that we picked up a six pack at the brewery. This might not sound noteworthy, but since we tend to collect beer, we usually limit purchases to 22oz bottles in the interest of saving space in our home/refrigerator. If you are looking for something a little lighter and more refreshing than an IPA, I really liked the Disco Lemonade as well (though I would recommend a sample before committing to a full pint). Bellingham is a great little city with plenty to do, I highly recommend a weekend here, especially if it involves a stop at Aslan. There is nothing more Northwest than the IPA. We love our hops. Be it with a hint of pine, grapefruit or maybe even licorice, we love the IPA. I may not be the biggest IPA expert in the world, but I’ve had a lot of them. In fact, according to my Untappd (Husky13836) I’ve had over 354 different IPAs in the last 4 years. I’m very proud of that. So now I want to rank my top IPAs. I have MANY favorite IPAs, but I’m doing my best to give love to the best ones I’ve had. So here are my rules, it must be a craft brewery and it must be from Washington. So sorry Deschutes, you make some great beer, but you’re not making this list. Nor are you Redhook, Pyramid or Elyisan. And it must be a beer you can get often, nothing experimental or the occasional small batch. Trickster IPA (Too big) – This is an IPA done right. If you’ve never had the Trickster IPA from Black Raven Brewing, you are missing out. Black Raven is easily one of the best breweries in the state. Space Dust IPA (Too big) – I love me some Space Dust. And even though I’m a little bummed that Elysian sold out (I don’t blame them, they go PAID), but Space Dust is starting to appear everywhere and it is absolutely wonderful. Iron Horse IPA (Too big) – Iron Horse Brewing in Ellensburg has done everything right. They make awesome beer and they’re in the greatest city ever (CWU Grad here). And I’m excited to say that they are too big to make this list, and they should be damn proud. But I love their IPA. I know their flagship is the Irish Death, but their IPA is completely worth it if you find it. Another IPA – Flying Lion Brewing: Fun fact about their brewer Griffen, he is in his mid 20s. That is nuts. Being a head brewer and owning his own brewery at that age. I find that very impressive. Flying Lion located in Columbia City Seattle is a new and up and coming brewery with a solid IPA. The Another IPA. A little malty with a nice hoppy finish, this is a brew you can easily enjoy. Flashing Lights IPA – Cloudburst: It is difficult for me to pick just ONE of their IPAs, since they are all good. Each one just a little bit different but all of them equally drinkable. I’ve only been to this brewery once, but it is a place I’m going to enjoy more and more in the upcoming months. This brewery is going to be big. And their IPAs are going to be a staple of my diet. Alpha Factor IPA – Postdoc Brewing Co: The motto for Postdoc is “See life through a different lens” and damnit, that lens is delicious. Postdoc now has been only open for about a year and they’ve come on to the scene strong. When you drop a tasty beer like the Alpha Factor, no wonder the brewery is doing so well. Compared to the other IPAs I’ve reviewed so far, this is by far the most crisp and clean, and not as hoppy. But there is enough hops at the finish to absolutely enjoy. So head on out to Redmond and try this tasty IPA. As we finished up with the in-town Poulsbo breweries, Bing maps reminds me that there is one more near, Sound Brewing. I’ve had Sound MANY times before, but never at the brewery. So even though it was late, and I knew I was only having a small sample, I needed to see the brewery. To get to Sound, you need to drive around Liberty Bay, which is just a few minutes away. If you haven’t been to Poulsbo, you need to seriously go. It’s beautiful, with good food, good views and GREAT beer. And Sound is one of those good breweries. While I only had a sample of one of their beers at the brewery, I’ve had several of their beers. Reluctant IPA, Cave Bear, and Triple Entendre are all beers I’ve enjoyed. The Reluctant is your traditional northwest IPA which a great hop smell with a hint of citrus. A true northwest beer. Another wonderful beer is the Triple Entendre, which sitting at almost 10% abv is a real kick in the head. If you like tripels, then the Triple Entendre will be very enjoyable. At the end of the day I cannot say enough about Sound Brewing and the rest of the Poulsbo breweries. Spend a day there, maybe even check out an AirBNB and stay the weekend. It is a very delightful place.